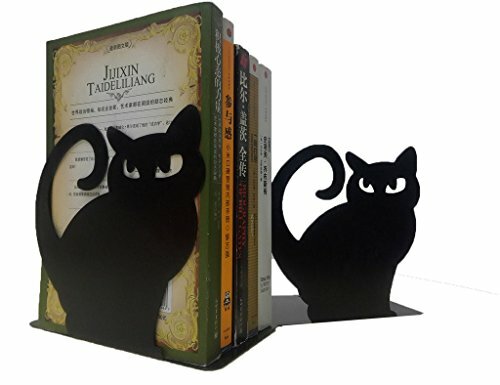 Winterworm Cute Vivid Lovely Persian Cat Nonskid Thickening Iron Metal Bookends Book Organizer For Library School Office Home Study Desk Organizer Perfect Mother's Day Gift(Black) by Winterworm at Animal Backgrounds. MPN: TC126B. Hurry! Limited time offer. Offer valid only while supplies last. Description: Every time when you see orderly bookshelf, it is will stimulate to the desire to read books, then you will be a man of deep learning. Every time when you see orderly bookshelf, it is will stimulate to the desire to read books, then you will be a man of deep learning. Unique vivid Persian Cat design, give you special journey in the ocean of books. Keeps books vertically organized and in place so books don't easily tip. Decorate your study room and Keeps your books organized and in view. Perfect for housing DVD's, video games, or CD's. keeps scratches to a minimal and prevent slipping. Keeps magazines, books, catalogs and binders neat in the bookshelves and all in view. The book in the photo is not included in the package.